A new interactive map on the geography/land use pages demonstrates how the use of land within and around each watershed has changed over time. A slider control at the top left of the map lets the user change the year displayed, and a visibility slider at the top right to change the opacity of the land use layer. 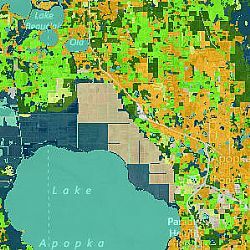 An accompanying chart quantifies acres of land in each type of use in incremental years. This new feature is available on all Water Atlas sites.